The sperm whale is found in the deep waters of the oceans, from the Arctic to the equator, and it can also be found in the Mediterranean Sea. It is easily identifiable because of its distinctive shape and unusually large and box-like head which can reach up to 20 feet long (up to 1/3 of its body length). Its scientific name macrocephalus is derived from a Greek word, meaning "big head." It is common for the head of the sperm whale's head to be covered with circular scars made by the suckers of giant squids that the sperm whales enjoy hunting and eating. Male sperm whales can reach up to 65 feet in length and weigh between 40 and 50 tons. Females are much smaller, reaching only 39 feet and weighing only 18 tons. 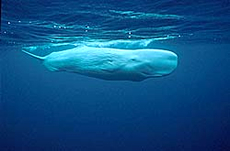 The skin is gray to black in color, and some albino sperm whales have been observed. The sperm whale was given its common name because of a white milky substance found in the head that was once thought to be sperm by whalers. Biologists still do not know what the purpose of this substance is, but some believe it serves as a liquid weight to help the whales sink easier when ready to dive deep into the water. The blowhole slit is S-shaped and found on the left side of the head. Sperm whales can blow water up to 50 feet above the ocean surface. They are the largest of all toothed whales and the largest toothed animals on earth. Sperm whales prefer deep waters and are known to dive as low as two miles below the ocean surface. They are carnivorous, feeding on giant squid, octopus, skate, and fish. They prefer waters where squid populations are abundant since this is their preferred diet. Some have been observed attacking and eating sharks. Adult sperm whales can eat over a ton of food each day. They are very social and prefer to remain in groups, which helps to fight off prey such as killer whales. Like dolphins, sperm whales use echolocation to catch prey in the darker parts of the oceans, and mothers use it to keep track of their young. Breeding can occur year round, and females give birth to one calf after a gestation period of 16 months. 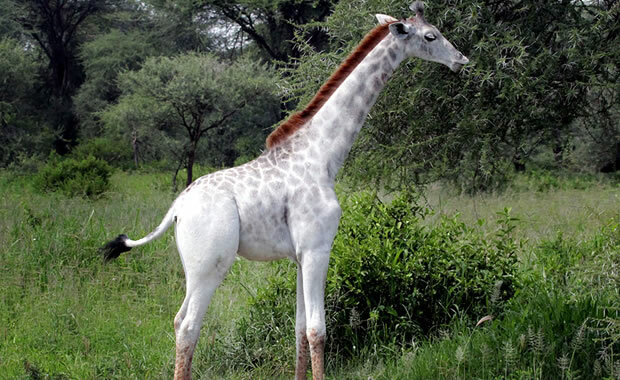 For many years, this species suffered from over-hunting for its meat, oil, and other body parts that were considered valuable. Since whaling has been banned globally, populations are slowly recovering. The estimate population today is 1,500,000. Copyright Notice: This article is licensed under the GNU Free Documentation License. It uses material from the Wikipedia article "Sperm whale". Glenn, C. R. 2006. "Earth's Endangered Creatures - Sperm Whale Facts" (Online). Accessed 4/18/2019 at http://earthsendangered.com/profile.asp?sp=934&ID=2. Need more Sperm Whale facts?